Dearly beloved, we are gathered here today to mourn the loss of a dear friend. A provider. A loving family member. An indispensable part of our lives that will be sorely missed. It’s been here with us only a short time, but in this time it has become such a profound presence in our lives. These are hard times, but I am glad we can join together and comfort one another as we grieve our loss, but also celebrate the joy that was given to us. Friends, thank you for being here for the homegoing service for DramaFever. Please reminisce with me, my loves. Do you remember the year 2009? It’s funny, now it seems like only yesterday. I was graduating from high school, gearing up to move into my college dorm. A little freshman, on the road to adulthood. Yesterday was all I knew, and the future was a big scary blob of the unknown. I would call my friends back home or wherever they were and we’d talk for hours about anime, Asian-Pop music, and of course, Asian dramas. During this time of my life, I was feeling really alone and isolated, and considering where my school was located, this is not an exaggeration. In those moments when I was feeling homesick and anti-social, I sought out something familiar. I needed the feeling of being transported into a different place and time, so I turned to my dramas. This is where I met DramaFever (DF). After a few minutes of conducting my usual search for a drama series, I came across their website. Here was a platform of hundreds of titles available to me, and I was in desperate need to get a drama fix. I eagerly scrolled through the pages and pictures and settled upon a series to begin! Pink Lipstick, the first of many. I settled into the fact that DF was now my home. Now that it’s gone, it’s going to be a long journey to find a platform that will give me this same sense of comfort. Sure there are other sites to choose from. Netflix and Hulu are getting on the ball, even Prime Video is dipping its toes into the water. Viki is another old classic, and even Crunchyroll has been with us for a while. But DramaFever set the stage for me. No more searching for series at random and seeing what site might have all the episodes on it, or downloading from torrent sites. Now, I could just watch a complete series, streaming online, with having to cross my fingers hoping the subtitles worked properly. The years that I have spent with DramaFever have been rewarding to say the least. Stupendous would be a closer word. I’ve discovered series that I would have never found, thanks to this drama streaming service. 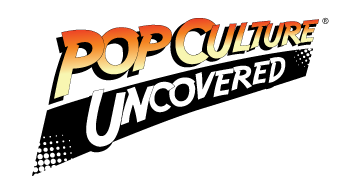 Their social media kept me informed on cultural hot topics within the entertainment world and new shows in production. I was introduced to one of the great loves of my life, TOP of the K-Pop boy group BigBang, thanks to his appearance in IRIS which appeared on…you know it! DF has been around, seen some growth, was taken over by Warner Bros, back in 2016, and was a few years into their annual awards ceremonies, the DramaFever Awards. Needless to say, this terrible outcome that we now must come to grips with is the last thing anyone would have expected. More so with So Ji Sub’s new series just coming out and being plastered on their homepage. When I got the news of the shutdown, I was talking with a group of friends on Facebook messenger about the YouTube outage of 2018 that caused YouTube to be offline for roughly an hour or so. A few minutes later, YouTube was back up and running like nothing ever happened. As a matter-of-fact, I’m listening to a YouTube video as I write this. Just as soon as we get the all clear that we can get back to our regularly scheduled lives, another message comes through to the group chat. If only it could be. Things were simpler yesterday. A few days ago I was happily watching Strong Woman, Do Bong Soon, and lining up my next few shows to watch. Looking back on those days, I feel like such a fool. Why didn’t I check back on the site sooner? How did this happen? How could I have missed the signs that something was wrong? I can only blame the fact that I’ve been binge-watching The Good Place for the last few days, and I neglected my sweet DramaFever. In that time, it slipped away from us. Softly, and quietly. Gracefully accepting its fate and leaving only that note behind to let us know, that it’s gone. My good people, I thank you for coming along this journey with me. October 16th, 2018, marks the end of a beloved streaming service. 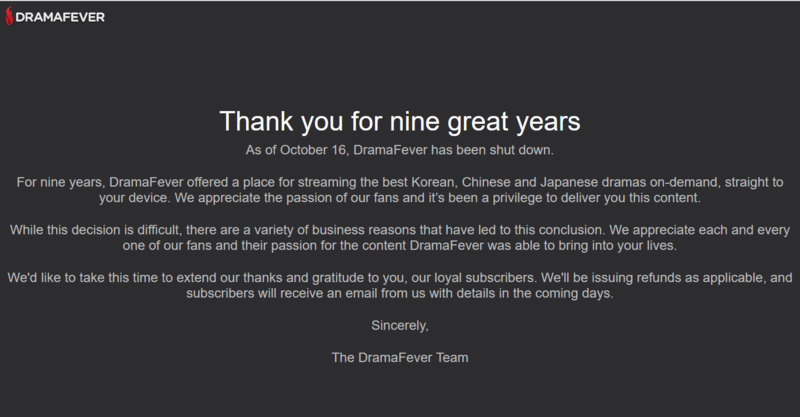 DramaFever, we will surely miss you; not only for the series you’ve brought to us these past 9 years, but also for the ones that were sitting in our watchlists. To quote Shakespeare, because there’s an opportunity to do so right now, “Good night, good night! Parting is such sweet sorrow…” And be sure to stay for the repass. We’ve got plenty of soju and kimchi in the back.